It is an innovative sushi, produced by using Japanese technology with totally different approach from the conventional sushi. It has a very deep umami but at the same time it is fresh. It has been impressing and surprising people so much even in Japan. The history of sushi began as a matured sushi called “nare-zushi”. Its root dates back to 1000 years ago. 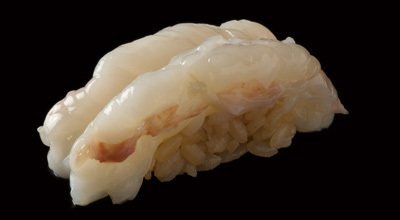 The current nigiri style was created about 400 years ago. When it was difficult to maintain the perfect temperature to keep fish fresh, people studied very hard to find a way to keep the fish, and that became a source for creating the techniques for maturation and fermentation. Thus, the culture of Japanese sushi was born. Now with the development of logistics and refrigeration, the point of importance has turned to freshness. On the other hand, research on reconstructing the traditional technique has been also active. By incorporating the current refrigeration technique and the maturation technique to bring out the umami to the utmost extreme, matured sushi was born. Maturing is not just letting the fish sit in the fridge. This leads to decay. 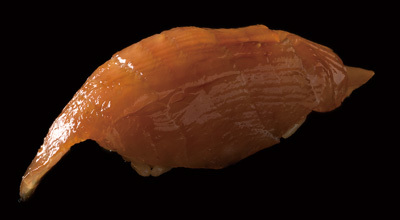 By controlling the refrigeration technique and the skill to control the moisture content in the fish, it leads to the wonderful maturation stage. It is a gem of the most advanced Japanese technology. Fujiro, after a great amount or research and experience, chooses the fish suitable for maturation and does not mature all kinds of fish. Serving some fish suitable for maturation as matured sushi, and serving some that are not suitable for maturation, fresh, and this is what makes it so exciting for the eaters. 180kg of natural Bluefin tuna after 14 days of maturation. You can feel its depth of umami, melting in your mouth. Botan shrimp after 72 hours of maturation. Plump as always to the palate, and its special texture with deepened sweetness and richness feels somewhat sticky to the mouth. Bonito after 7 days of maturation. We mature them by circulating the moisture inside the flesh as if we make them breathe. Amberjack after 6 days of maturation. The best is called great amberjack that weighs over 10kg. Before eating you dip it into a special soy sauce for about 50 seconds and drop some Japanese lime on. It is a technique to dramatically increase the amount of inosinic acid by utilizing the enzymes contained in fish flesh, e.g. ATF (adenosine triphosphate), etc. Inosinic acid is one of the components of umami. Each house keeps the maturation technique unique and secret. The technique of Fujiro is an original one, created by Fujiro Chairman Takatori and Daisuke Fujinaga, who has incorporated the maturation technique into Sushi for the first time after 400 years of history in sushi-making.